In the late ’80s and early ’90s, 3on3 basketball tournaments hardly existed outside of the Midwest United States. The idea of Spokane Hoopfest was born from two separate groups: one group with members from the Midwest who wanted to see the continuance of the 3on3 ball they had back home and the other with members trying to raise money for Special Olympics. Eventually the two groups merged under co-founders Rick Betts and Jerry Schmidt and Spokane Hoopfest Association was created. Finding support for the first tournament proved a challenge as Hoopfest wanted to do something no one else had: shut down the streets of downtown Spokane for two full days of basketball. By going door to door and winning a majority of downtown business owners over with the idea, the permit was granted and 36 courts were taped off on the asphalt. 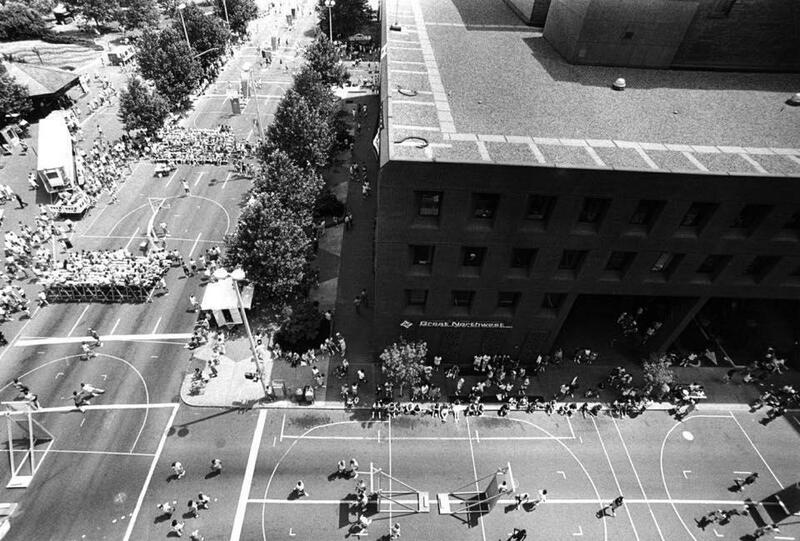 On June 30 and July 1, 1990, a group of dedicated volunteers including founding board members Betts, Schmidt, Dave Jackson, Terry M. Kelly, Dennis Magner and Rick Steltenpohl coordinated the first Hoopfest. The tournament hosted 2,009 players on 512 teams. The event was such a success in its first year, the City was happy to have it back again the next summer. Thus began the tradition of Spokane shutting down its downtown core during the last weekend in June to let people play on the streets. In the many years since inception, Hoopfest has developed into much more than a basketball tournament. Activities have been added to enhance the event experience such as a youth and adult center courts, games and contests for every age, music playing throughout downtown, merchandise tents, and more. Hoopfest has grown to become the largest 3on3 street basketball tournament and family festival of its kind in the world. Annual participation in Hoopfest exceeds 6,000 teams and about 25,000 players. With players coming in from 42 states including Hawaii, Georgia and Kansas, it now takes 450 courts to house the 14,000 games. It is believed that the second largest 3on3 basketball tournament in the country has no more than 1,500 participating teams. With so many thousands of people in town for Hoopfest, Spokane’s economy is greatly impacted each June. A survey was conducted in 2006 by an independent third party to accurately assess the spending done by Hoopfest participants over the course of the event weekend. Using this survey, Hoopfest predicts that the event brings 39 million dollars into the Spokane economy. This figure includes everything from hotel rooms and shopping to entertainment and dining. Beyond the immediate economic impact of the tournament weekend, Hoopfest is committed to supporting area charities. Since 1990, Spokane Hoopfest Association has donated over $1.6 million to organizations such as Special Olympics, and other youth sports programs, as well as its court construction and renovation program. Hoopfest has built or renovated over twenty-seven outdoor basketball courts in area neighborhoods so local residents have an opportunity to play year-round. Spokane Hoopfest is extremely proud of its 3on3 tournament. With the generous support of the City of Spokane, many wonderful sponsors, and 3,000 dedicated volunteers, Hoopfest has grown into an unparalled event that is cherished by the Inland Northwest. In receiving the 2003 Agora Award for Business Excellence, the judges said the following about Hoopfest: “No other single event (here) brings together people of such diverse cultures, economic conditions, and ages for a common purpose. And this common purpose is not just basketball. It is cheering for one another, working together, competing fairly, and celebrating Spokane.” With a successful and solid foundation, Spokane Hoopfest boldly looks forward to an exciting and rewarding future! For more on the history and tradition of the largest 3on3 basketball tournament on earth, check out the Hoopfest book.